One of the biggest strategic decisions a program manager has to make is how much process to deploy. It is important to distinguish between rules and guidelines when one is establishing project management processes. For instance, it can be a rule that sign-oﬀ occurs at a stage gate, but the content of what is signed oﬀ at the gate is based on guidelines. It is diﬃcult for any organization to establish rules that apply to everything without becoming bureaucratically intractable. Guidelines allow the use of judgment by project managers and actually foster accountability. Ideally, there should be very few rules compared with the number of guidelines. The program manager has to strike a balance between process and people. People dependence means the organization depends on the ability of its people to properly execute work activities and tasks. Process dependence means the organization depends on processes to ensure the proper execution of work activities and tasks. Figure 4-1 illustrates the necessity for balancing these two ideas. Often, organizations start out with very little process and are highly people-dependent. Eventually, because people are human, someone makes a mistake and there is a cry to create a process to prevent a recurrence of the mistake. Unfortunately, a lot of organizations overreact and create too many and/or too restrictive processes that actually prevent work from being accomplished. 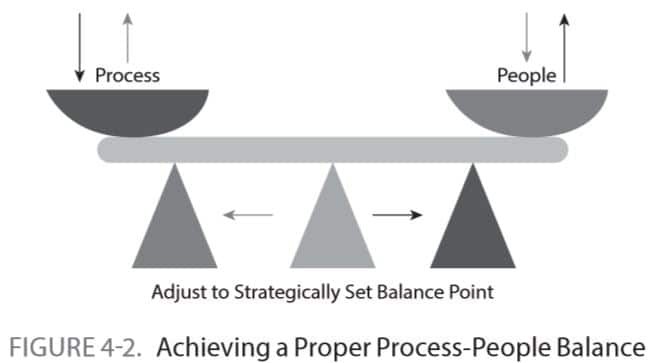 Organizations with good, active leadership often swing back and forth over time until a comfortable balance is struck, as illustrated in Figure 4-2. Look at the advantages and disadvantages of being heavily people-dependent. 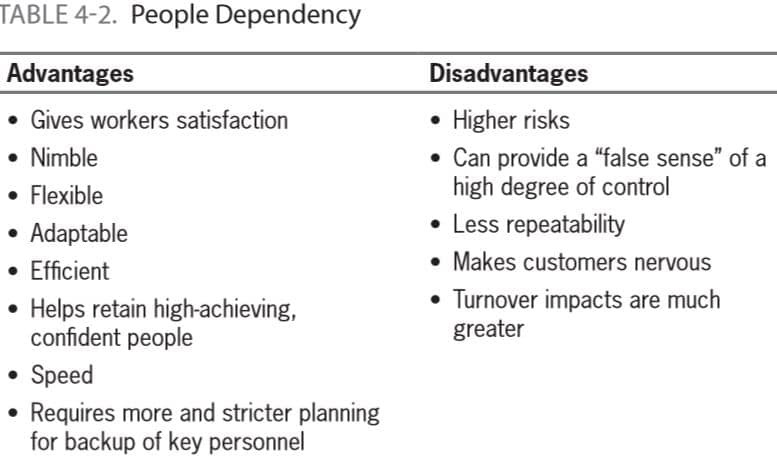 Table 4-2 gives a breakdown of the advantages and disadvantages of a people-dependent culture. 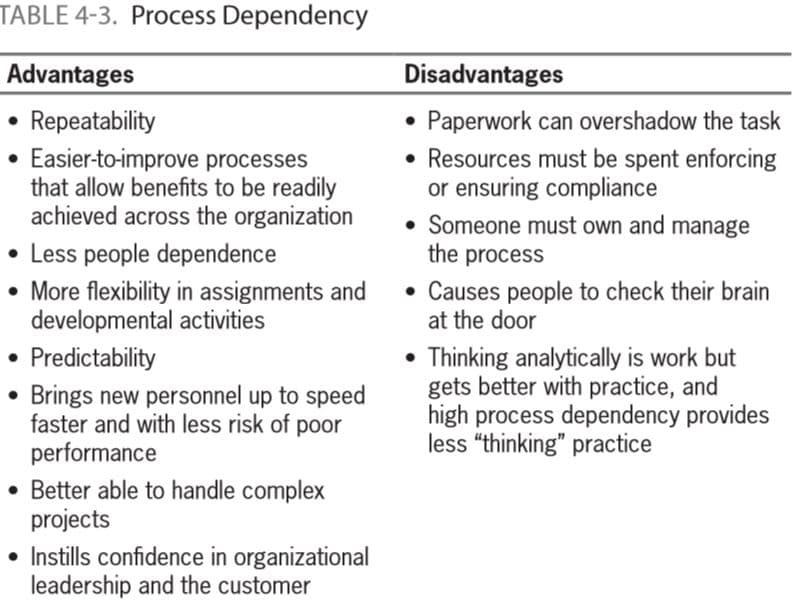 Now look at the advantages and disadvantages of being heavily process-dependent, as illustrated in Table 4-3. A lot of factors go into how process- or people-dependent an organization or work segment needs to be. These factors include the criticality of the operation as well as the availability and ability of the people performing the work. The true test of the validity and eﬀectiveness of the program’s processes is whether people actually use the processes to do the work. Conversely, do they have to work around the process to accomplish the task? Companies I have observed that have the highest degree of success typically tailor their methodology in regard to what project managers have to provide. They are intentionally inconsistent. They may have a comprehensive menu of processes and deliverables that project managers can provide. At the start of the project, after an initial assessment by the project manager, the deliverables or artifacts that will actually be provided are negotiated between the leadership (program manager and/or PMO) and the project manager. Some organizations pre-deﬁne a set of deliverables that are based on project cost, customer, or complexity, and this is good. However, taking the time to independently assess each project provides a degree of ﬂexibility that allows the project manager’s level of skill and experience to come into the equation, with consideration of the context of the speciﬁc project to be implemented. Do you really have to have an experienced project manager who has delivered similar projects many times provide the same artifacts that a relatively new project manager or a project manager who is new to this type of project must provide? Some organizations will respond “absolutely” to this question. Whether you answer yes or no is not the point here. The point is that you, as a leader, have thought about this and will continue to critically and periodically think about your strategy. # Best Practice, Process, program management, Project Management on May 24, 2016 by Nick Matteucci.